Posted on 12/21/2017 at 1:10 pm. Posted on 06/10/2017 at 9:31 am. Hot on the heels of their recently released and critically acclaimed magnum opus Heartless and fresh off of a US headline tour in support of it, comes this. 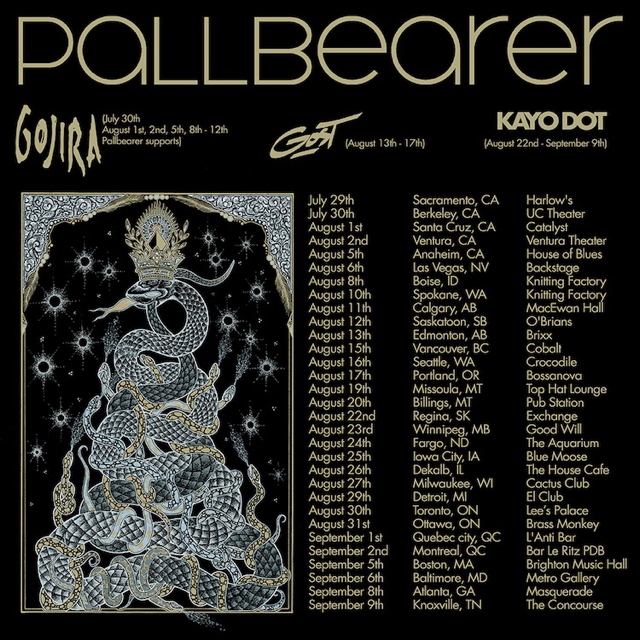 The genre-defying giants Pallbearer have announced an extensive North American run commencing in late July (supporting Gojira) and then continuing onward as a headline tour from August through September. Support on several of the latter dates will come from Kayo Dot and Gost. Check out the full routing below. Heartless was recorded straight-to-tape with Joe Barresi (Queens Of The Stone Age, Tool, Melvins, Soundgarden) and it is out now from Profound Lore Records. Posted on 05/18/2017 at 10:49 am. We are now just a day away from what is expected to be one of the most crushingly depressive releases of the year being set loose upon all. That’s right, the long awaited and oft-doubted return of the Nashville, Tennessee-based Loss is finally at hand. The unholy event would provide ample cause for celebration were it not for the sullen, bleakly depressive hopelessness the unit is so well known for providing. The lividly aural obtuseness that is brought to life, then near death, in the music of Loss is of the utmost cause for alarm. Not is it merely a semi-hellish soundtrack of bereaved emanations but it may very well be the actual house music within a damnable Hades itself. Six years since the debut ‘Despond‘ was unleashed upon the denizens of the Earth, Loss return with the Billy Anderson-produced Horizonless via Profound Lore on May 19th. All of the prerequisite attachments are still here, ones ranging from atmospheric to funeral doom and more. But there is also a palpable, overwhelming sense of despondency reverberating through every note, Drawn out, sustained death marches into the deepest chasms of soulless emptiness, where each forcible step is one nearer to the point of no return. Haunting, harrowing and truly horizonless for there is no light at the end of this tunnel’s descent, no momentary glimpse of anything to inspire hope. Much like a Death Row inmate’s last moments, you feel surreally out of body as your physical husk moves slowly toward its inevitable end. And this is the music most ideally meant to accompany you on that journey, on both planes as your last steps on Earth become your first taken into Eternity. The title track’s last few spoken moments perhaps put it best, put it all into perspective: “Something Is Lost..Nothing Is Gained“. Posted on 03/27/2017 at 12:13 pm. Have you ever seen the expanded version of Bruce Lee’s “Enter The Dragon?” During the opening sequences, he expands more upon the philosophical underpinnings to his martial arts style, or no style, as he’d probably say. He believes that the ultimate form is no-form, that a Zen-like detachment from the rigors of the overly traditional allows for unparalleled creativity, fluidity and freedom of expression. He definitely believes that this no-form is a clear expression of intense feeling, as there’s also a poignant scene of him training an aspiring student where he emphasizes “emotional content” in the student’s strikes. “No, not anger! !” he corrects, “emotional content.” I re-watched this movie quite recently on one fateful night, and it got me to thinking about how these concepts played out in music. 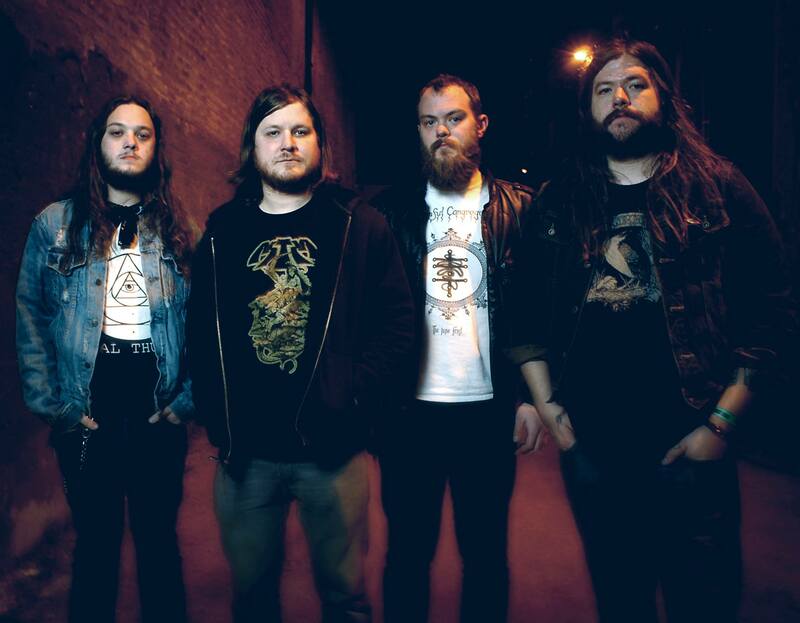 And that got me to thinking about Pallbearer…. My first experience with Pallbearer was seeing them tear it up live. That’s always a great place to start when you’re getting into a band, because there’s no pretense there, only direct experience. Right before I first left Black Pyramid in 2011, we shared the stage at the first Days Of The Doomed Festival in Wisconsin. I’d actually heard quite a bit about them, as they had a demo that was much lauded in both the traditional doom scene and the broader metal community, and they had a reputation for punishing heaviness live. I honestly wasn’t sure what to expect. Because of the name and their rumored heaviness, I was actually expecting them to be a death/doom band, which they clearly are not. Needless to say, they didn’t disappoint in the slightest. Once I was properly baptized in the power and glory of their glowing tube amps, there was no turning back, and you could count me among the faithful. What impressed me the most was their mixture of the traditional and the modern; they definitely nailed that timeless classical metal influence with their twin guitar attack, which alternated between crushing down-tuned riffs and labyrinthine dueling leads, yet the tones were more modern, while the songwriting itself was forward thinking and intelligent. It didn’t hurt them any that their rhythm section was rock solid and the vocals were soaring high (so was I). The experience was most triumphant and I was an instant fan. This was indeed a band of exceptional promise…. Fast forward to a year later, and the release of their debut album, Sorrow And Extinction, on Profound Lore Records. I have tremendous respect for that label, as they have discriminating and impeccable tastes. What a sound Pallbearer had developed on record! It was heads and tails above their demo: emotionally charged, transcendentally structured, and as meticulously melodic as it was devastatingly heavy. 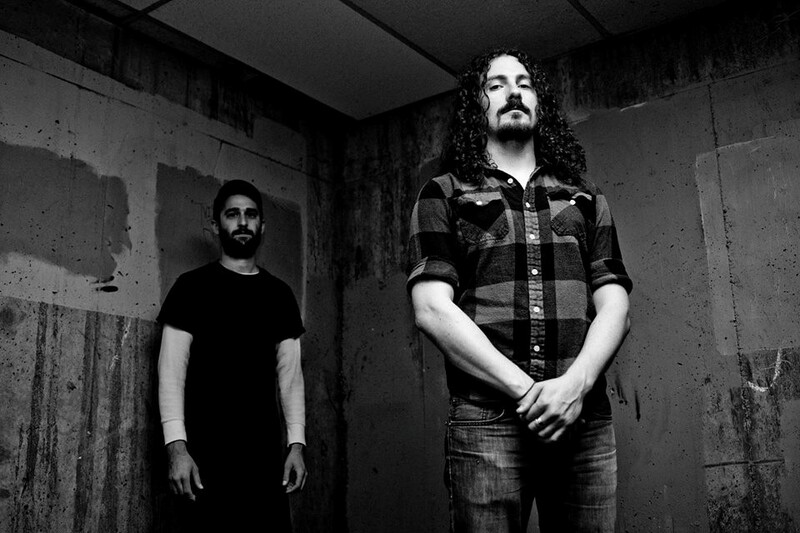 Their debut quickly brought them to the forefront of the metal world, and with their sophomore album, Foundations Of Burden, they only solidified their destiny as the new rising stars of underground metal. They experimented more with tempo and song structure, and deepened their understanding of the emotional power of melody. This brings us to March 24th, 2017, the date they’ll unveil their latest masterpiece, the ironically named Heartless. Well, I’d say that it’s ironic anyways, since their music seems anything but heartless to me. It’s chock full of emotional content; it’s over brimming in every note they pick, every chord they strum, every drum that’s struck, every word that’s sung. Not since the much missed doom masters Warning walked this world have I heard a band that so encapsulates the concept of emotional content. This is a seven song, hour long tour de force of angelic agony, bizarre beauty, mind-melting misery and earth-shattering ecstasy. I’ll admit that it’s a bit long in the tooth, and this really demands active listening. Those who have the endurance and the attention span are duly rewarded, as this is as rich and fulfilling an album as I’ve heard in recent years. I heard all kinds of wild rumors before Heartless even came out: they were a post-rock band now, the new album wasn’t heavy, they’d sold out. Don’t believe the hype. They’ve definitely taken a more progressive stance, though it’s not a radical departure by any means. As my friend Stephen Loverme from the bands Olde Growth and Sea sagely stated on this very day, “The new Pallbearer sounds like a doomed out Porcupine Tree. I’m 100% okay with this.” Wiser words are rarely uttered. There’s just more going on, from meticulously layered guitar passages that twist, turn and wind down all sorts of mesmerizing staircases, to subtle acoustic flourishes and backdrops of effected soundscapes, to melancholy harmonized vocals. There are even more tempo changes, key signature switches, the versatility in the vocals, and clever changes in tone and texture than on the previous album, and the production is even more stunning and meticulous. What’s most impressive is how subtle and slow burning it all is, how fluid and free, like the no-form of Bruce Lee’s metaphysical martial arts. This is a modern masterpiece deserving of every iota of praise that’s thrown its way, paying tribute to the masters like Candlemass, Trouble, and the New Wave Of Heavy Metal, yet it’s delivered with such urgency that it’s just as immediate as it is an instant classic. I’ve always said that it’s the reconciliation of opposites that makes for great art, a little lesson I learned from Herman Hesse’s novel, Narcissus And Goldmund. 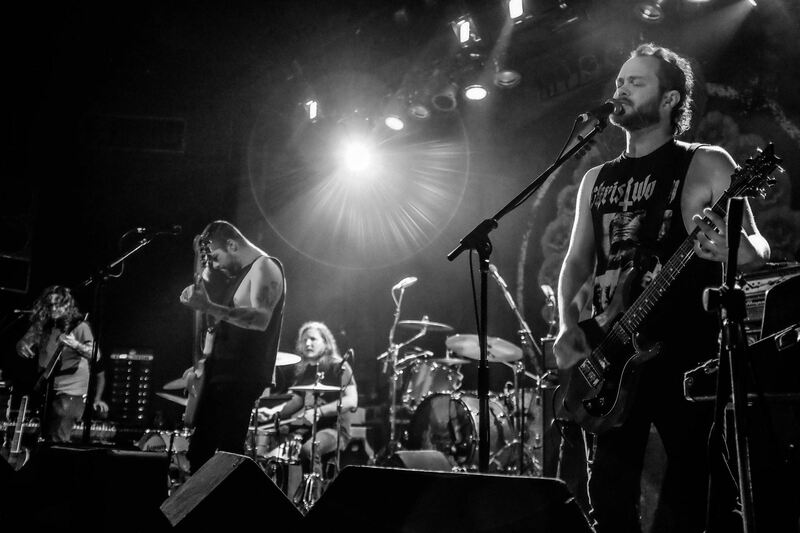 The juxtaposition and paradox that Pallbearer pull off….it’s utterly stunning. They’re the doom metal actualization and apotheosis of what Hesse was talking about. Often I take a listener through an album track by track, so they can get some reflection of my experience. I’m not going to do that here. Not at all. The reason is, I want you all to experience this for yourself without my impressions of the album coloring your sensations and perceptions. Take this in, savor it, remember that first time you put the needle to the wax, or the CD in the tray, or pressed play on your computer. Remember this moment, so that you can say that you were there when Pallbearer helped to redefine the face of modern doom metal.